Randall Leo Jones (born January 12, 1950), nicknamed "Junkman", is a former Major League Baseball left-handed pitcher. He attended Brea-Olinda High School in Brea, California. He attended Chapman University in Orange, California. He was known for his sinker and the large number of ground-ball outs he induced. Jones established the Major League season record for most chances accepted by a pitcher without an error (112 in 1976), tied ML pitchers records for highest season fielding percentage (1.000, 1976) and most assists in an inning (3, 9/28/75 - 3rd inning), and tied the NL pitchers season record for the most double plays with 12 in 1976. 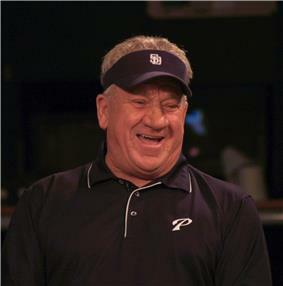 Jones pitched effectively for San Diego through the 1980 season. On December 15, 1980, he was traded to the New York Mets. After the 1982 season, Jones signed with the Pittsburgh Pirates. He was released by the Pirates before the 1983 season started, thus ending his playing career. ^ Walton, Ed. "The Ballplayers - Randy Jones". BaseballLibrary.com. Retrieved 2009-09-07. ^ "Randy Jones from the Chronology". BaseballLibrary.com. Retrieved 2009-09-07. ^ Kepner, Tyler (November 8, 2002). "BASEBALL; Zito Beats Martínez to Win First Cy Young Award". The New York Times. Retrieved May 22, 2010. ^ "Randy Jones BBQ Sauce". randyjonesbbq.com. Retrieved November 3, 2014.